This year's tournament witnessed an improved draw. Over 130 settlers attended the contest this year, a good jump from last year. By my count, 25 or so settlers were wearing the "one-day" badges. This is another indication of the continuing popularity of 1996s "Game of the Year". The format of this year's fest mirrored last years. Random set up, random dice rolls, random decks were all standard fare. 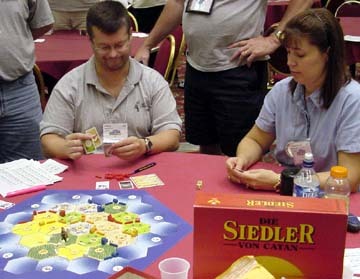 The addition of placing a city instead of a second settlement and placing a third road at start were items introduced from the KOSMOS tournament in Germany. I'll continue to have us mirror their concepts in future years. The tournament specific rule of not being able to play a Knight card before rolling the production dice will be re-considered for next year. Any future 'tinkering' (or reduction of 'tinkering') will have ease and speed of play in mind. The assistant GMs for this event earned their pay this year. At 9 o'clock, the line for entering the tournament was nearly out the Valley Ballroom door, despite starting the sign up at 8.30. I'll have to go to three lines next year! Despite the number of entrants, we had everyone seated by 9.20. If you can manage it, bring a copy of the game! We had a number of people without a game this year. One kind soul gave me two sets to use. (If you are that kind soul, please contact me, as I have recovered those games.) The tournament consisted of three preliminary rounds. Entrants could (and some did) miss a round, but this made it impossible for them to advance to the semi-finals. Still, if you're coming to play, instead of pursue the wood, you are more than welcome to play, as long as you give me the word that you're leaving. First round was set at random, with each subsequent round sorted to keep players with the same level of points playing together, as reason allowed. Each player was awarded Tournament Points for their placement in their games. Five points for 1st, three for 2nd, two for 3rd and one point for 4th place were earned. Ties for a position simply split the points earned. The top 16 scorers would advance to the semi-finals. A published procedure was used for resolving ties. This used a percentage of points earned at the table. The time limit was set at 90 minutes per game. This included set-up of the map as well as playing out the game. With over 130 entrants playing in nearly 100 games, it's a credit to the players as well as the tournament rules (thank KOSMOS) that none of the games were adjudicated (for the second year in a row!). As the preliminaries drew to a close, the pencils and calculators were brought out. Last year, the tournament point count needed was 11. This year, the cut off was 11.5. A special acknowledgement goes to Su Hung. She lost all three games last year and ended up as the 17th ranked player this year, a clear winner of the "Most Improved" award. In addition, she pointed out a scoring error on her card that would have had her firmly in the top 16. She was good enough to remain at the GM table until it was verified that our 16 semi-finalists were present. Congrats to Su for being the Settler's Sportsmanship Award winner. On another front, we had two undefeated settlers going in to the semi-finals. Charles Hickock and Bill Duke were wearing their targets as the tables were set for the "Sweet 16". After a 90 minute round, Mike Musko, Charlie Faella, Thomas Saal and George Brace were left standing. As the Finals board was set-up, there was much deliberation about initial settlement placement. There was a clear dearth of Brick and Ore locations. Each flavor had a single effective payout number. Nearly one-third of the game time was devoted to the critical initial placements. The great difficulty in obtaining Brick and Ore, let alone trading for it, was evidenced by the purchase of Roads for eight Sheep and Settlements for 10 Commodity cards. Scores reached 5, 6, 7 & 7 points without anyone taking ownership of the Special 2 point cards. Despite the hard scoring environment, Charlie Faella met the 10 point goal ahead of the other finalists. Final scores: 10,9,8,7. Thanks to everyone who entered. I'm already looking forward to next year.